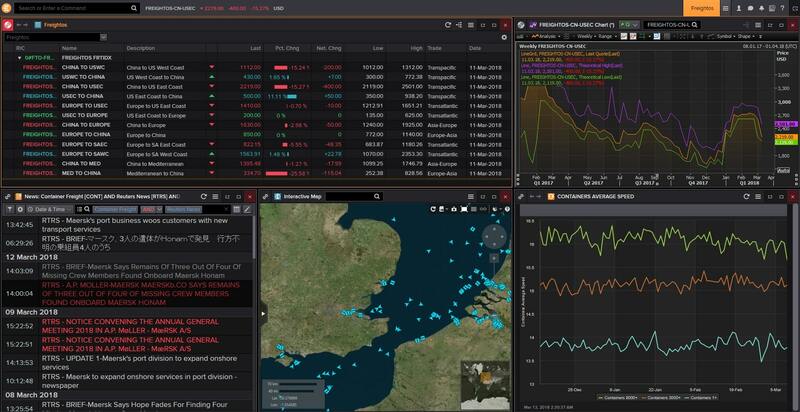 March 19, 2018, London – Global freight indexes provided by the online freight marketplace Freightos are now available on Thomson Reuters flagship financial desktop product Eikon, providing users with comprehensive insights into global freight market movements. As international merchandise exports grew by nearly 40% in the last decade, businesses are increasingly tapping into rapidly changing data to fine-tune global supply chains. As of March 19, 2018, Freightos International Freight Index (FIFI) data will be available within Eikon terminals, providing insights derived from Freightos’ global freight database of over one billion unique pricing points. Powered by anonymized real-time business data from global freight carriers, freight forwarders, and shippers, FIFI provides import and export prices of 40ft container prices on key shipping lanes, including China-US (West Coast or East Coast), China-Europe, China-Mediterranean, Europe-US (East Coast) and Europe – South America. Freightos FIFI is updated every Sunday. To access weekly ocean freight rates for 40′ containers from Freightos International Freight Index go to <0#FREIGHTOS> or, to access the Freightos App, type FREIGHTOS into Thomson Reuters Eikon. Additional Freightos index data is available at www.freightos.com/index, with individual carrier/route data available at www.freightos.com/rate-insight. Freightos® makes global trade frictionless with the world’s online marketplace for the trillion dollar international shipping industry. The Freightos Marketplace helps importers and exporters reduce logistics spend and save time with instant comparison, booking and management of air, ocean and land shipments from top logistics providers. The result is international shipping that’s as smooth as booking a flight online. Freightos also provides patent-pending technology that empowers carriers and logistics providers around the world to automate freight sales. Freightos AcceleRate™ and Freightos WebCargo™ power rate management, automated pricing, and online freight sales for over 1,000 logistics service providers and carriers, including multi-billion dollar companies like Panalpina and Nippon Express.